Guwahati, Jul 8 : The fate of Manipur’s 1,500MW Tipaimukh hydel project will be decided this week when the Union ministry of environment and forests weighs its pros and cons in light of the Uttarakhand “lessons”. Given the fact the project envisages destruction of 24,329 hectares of forestland rich in wildlife and various environmental groups opposing it, the ministry has a tough decision to make while giving forest clearance to the project. 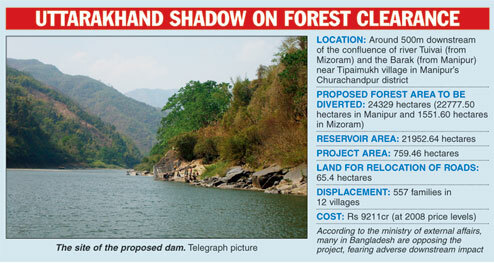 According to the ministry, the proposed area is one of the biggest for which a single hydel project has sought clearance under the Forest Conservation Act so far. The decision will be a tough one, as the ministry has already allowed diversion of 19,000 hectares of forestland for various purposes across the country in the past 18 months since incumbent minister Jayanti Natarajan took over. The project, if it does get cleared, will place at least 78 lakh trees in fairly dense forests in Manipur on the chopping block. Besides, a large area rich in wildlife will be submerged. Some portions of two national highways — NH53 between Jiribam and Imphal and NH150 between Churachandpur and Aizawl — will also have to be realigned. The project will come up for discussion before the forest advisory committee of the ministry for its clearance on July 11 and 12. Even the Manipur forest department is sceptical about the project. National Board for Wildlife member Prerna Singh Bindra said a project of such magnitude would have grave impact on the ecology as well as livelihood and cultures of the affected people. It could have potentially disastrous consequences, especially given the number of projects in the region, as Uttarakhand has tragically shown. “Speaking only of impacts on the environment — the project will destroy about 80 lakh trees and huge quantities of bamboo — it will drown huge swathes of semi-evergreen and evergreen rains forests. The rare and endangered wildlife in these forests include the hoolock gibbons, clouded leopards, golden cat, red panda and the rufous-necked hornbill, the state bird of Manipur. Why have the impacts not been weighed from the wildlife perspective? Or, do we respect and protect wildlife only within the confines of a protected area?” she asked. Though the ministry had constituted a five-member sub-committee to make a spot inspection, it could not do so because of monsoon rain. It had given the environment clearance to the project in 2008. A project is given environment clearance after assessment of its impact on the environment and people along wi-th the measures to minimise this. The forest clearance, on the other hand, is required for diversion of forestland for non-forestry purposes. Environment groups are also opposing the project tooth and nail. “It must not be forgotten that Tipaimukh is also part of the eastern Himalayas/Indo-Burma biodiversity hotspot, one of the few such areas in the world. The forestland proposed to be diverted for the project contains 78,16,931 trees and 27,000 bamboo columns. “This is simply alarming, as Manipur cannot afford to sacrifice such forest resources for the dam, as this will extensively affect the indigenous people of Manipur,” said three civil society organisations opposing the project in their petition to the ministry.